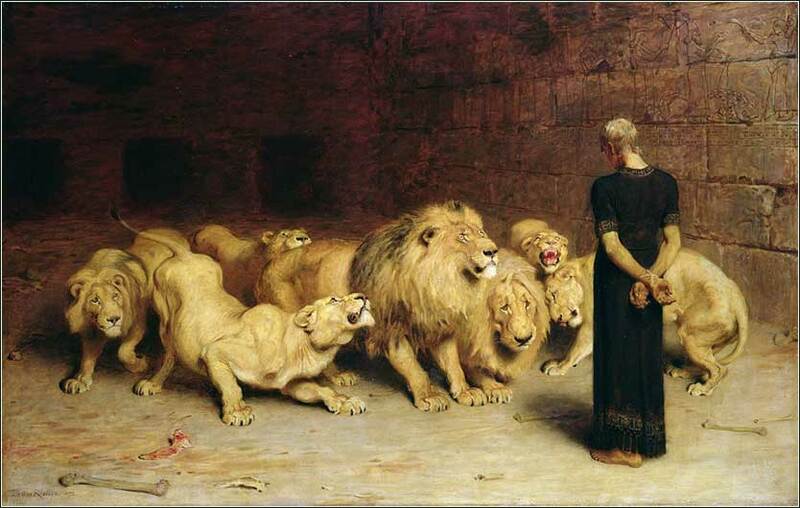 Daniel in the Lions’ Den by Briton Riviere, ca. 1890. Dear Heavenly Father, I am learning to understand what your word says. Yet so often I simply hear it or read it and think about applying it, but get no further. I pray that you will help your word to sink into my mind and soul, for you word is life itself. Help me to focus my mind and open my spirit and my heart to your eternal truth. The Rich Man in Hell by James Tissot, ca. 1890. This illustrates the parable of Lazarus and the rich man, from Luke 16. In life, Lazarus lay in the street with dogs licking his sores, pleading with the rich man for help. Now they have both died, and seeing Abraham with Lazarus, the rich man pleads for mercy as he roasts in hell. We live by revelation, as Christians, as artists, which means we must be careful never to get set into rigid molds. The minute we begin to think we know all the answers, we forget the questions, and we become smug like the Pharisee who listed all his considerable virtues, and thanked God that he was not like other men. Now Moses used to take the tent and pitch it outside the camp, far off from the camp, and he called it the tent of meeting. And everyone who sought the Lord would go out to the tent of meeting, which was outside the camp. Whenever Moses went out to the tent, all the people would rise up, and each would stand at his tent door, and watch Moses until he had gone into the tent. 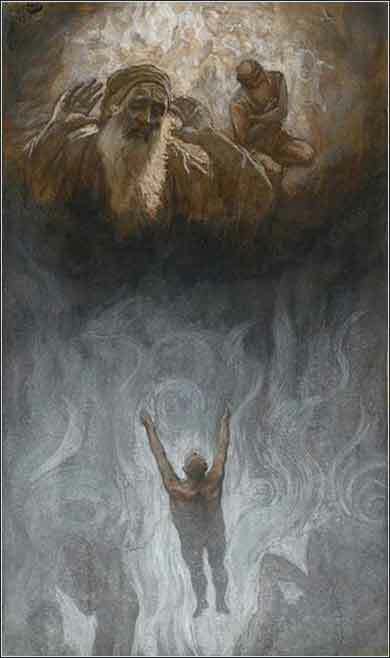 When Moses entered the tent, the pillar of cloud would descend and stand at the entrance of the tent, and the Lord would speak with Moses. And when all the people saw the pillar of cloud standing at the entrance of the tent, all the people would rise up and worship, each at his tent door. And he said, “My presence will go with you, and I will give you rest.” . . .
With the tabernacle yet to be built, Moses pitches a temporary tent outside the camp, and God makes His presence known to the fickle Israelites by manifesting Himself as the familiar column of cloud. Here Moses can speak with God in person, without having to ascend the mountain again. God's favor with Moses is enormous; as with Abraham, God will talk to him as a friend, allow Moses to argue with Him, and respond to questions. The term "face-to-face" in the third paragraph, used in the original Hebrew, confuses the subsequent discussion of Moses seeing God's face. But "face-to-face" in ancient Hebrew was idiomatic, as it is today, and obviously cannot be taken literally. Human language, whether Hebrew or English, finds it difficult to express the ways in which God might manifest His presence. Moses sees something inside the tent (and atop Mount Sinai), but what he sees, he does not describe. There is something else he calls God's "glory" that he wants to see and has not; and yet another, higher level, which he calls God's "face". We simply have no idea what any of this would look like, although we get later descriptions of God's manifestations, such as the fantastic visions in Ezekiel and Revelation. The one thing we know, for certain, is that a human being cannot see God's “face”, i.e., see Him as He actually exists. God tells Moses in this passage that "man shall not see me and live." Today, we look at this the other way around; we do not expect that we will see God until after our death. This matter is part of the wonder of Jesus Christ, of course; God became fully human and the people of the time could look into an actual face, the face of God made man. But when Moses speaks of the "face" of God, it is simply a term used to describe something for which there is no word, for no living human has seen it. This lone mystery serves to highlight the lack of mysticism, generally, in this part of Exodus. There are no secret rituals, no unseen occurrences, no hidden writings: God tells the Hebrews, "do exactly this on this day or when this occurs and you will be righteous before me, and I will protect you." Even the rituals that will be performed by the high priests in private are spelled out; and although the Ark and its contents are to be hidden from view, the Hebrews will have seen them.